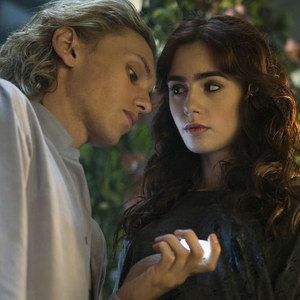 Before you head out to theaters to see The Mortal Instruments: City of Bones today, Sony Pictures has provided us with a high-resolution photo gallery from this fantasy adaptation, based on Cassandra Clare's novel. The story centers on Clary Fray (Lily Collins), who learns she descends from a long line of Shadowhunters that protect the world from demons and other mystical creatures. Take a look at these photos featuring Lily Collins, Jamie Campbell Bower, Robert Sheehan, Jonathan Rhys Meyers and Lena Headey.